Writer-director Angus MacLachlan (“Junebug,” “Goodbye To All That”) returns, once again, to the Southern terrain he knows best – and in the most literal sense. 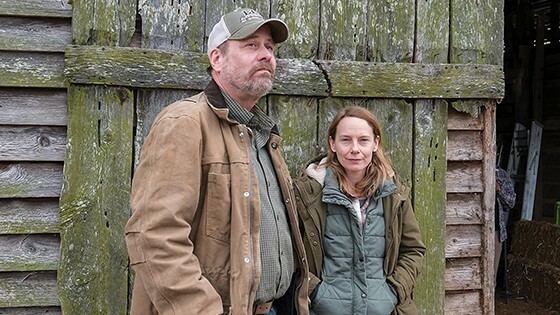 The story, exquisitely acted, anchors in the North Carolina tobacco farm left to middle-aged siblings Jesse (Terry Kinney) and Tracy Ledbetter (Amy Ryan) in the wake of their father’s death. Shortly after burying his ashes, the Ledbetters encounter a trio of strangers camping on the land, who are not strangers at all: The Triggerstroms, three brothers (played by Max Gail, Francis Guinan and Steve Coulter) whose own father, likewise newly deceased, sold the land to the Ledbetters more than 50 years before. The men catch their hosts offguard with an unexpected claim, one that changes everything that Jesse and Tracy thought they knew about their home.